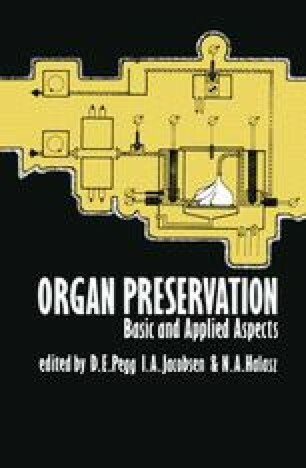 Perfusion preservation was introduced in clinical transplantation in 19671 and simple cold storage in 19692. Since then many articles have appeared in the literature suggesting superiority of one method over the other3–5. In general, however, it has been accepted that continuous hypothermic perfusion preservation is superior for kidneys subjected to periods of warm ischaemia and also allows preservation for up to 72 h. Simple hypothermic storage appears to be safe for up to 48 h in kidneys not subjected to warm ischaemia and up to 24 h in kidneys with warm ischaemia. The better results with perfusion preservation have been thought to be due to continued aerobic metabolism.